Mozilla release new version of Firefox browser software regularly. As expected, new Firefox version promises more enhancement, performance and features addition. It is always recommended to update Firefox browser to newer and latest version. Firefox support automatic updates feature that download and update Firefox software to latest version automatically. There is also an option to manually update Firefox to latest version. 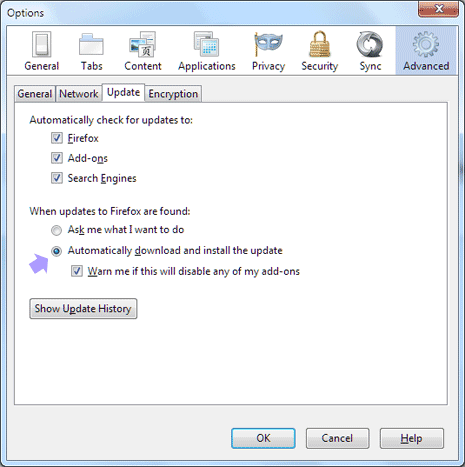 By default, automatic updates option is enabled for Firefox browser installed on your computer. As and when new update availability is detected by Firefox browser, you should get notification to install the update and restart Firefox browser. Automatic update notification appear when update has been waiting to be installed for more than 24 hours. Also, You can easily check if automatic updates option is enabled or disabled in Firefox browser installed on your computer. 1. Open Firefox browser and goto Firefox > Options > Options. This will open Options box on your screen. Click Advanced tab on the Options box. 2. Now click on Updates tab to check for options related to automatic updates feature of Firefox browser. Click to activate “Automatically download and install the update” option to enable automatic updates feature. If you have enabled automatic updates option for Firefox browser, then you can check for manual updates at regular time intervals and update Firefox when an update is available. 1. 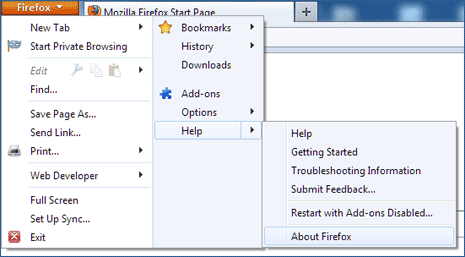 Open Firefox browser and goto Firefox > Help > About Firefox option. 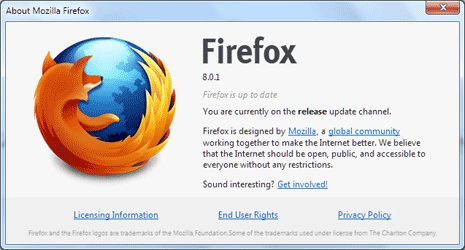 This will open ‘About Mozilla Firefox’ showing version and other details regarding Firefox software installed on your PC. 2. If new Firefox update is available, then you should see ‘Apply Update’ button under version listing on ‘About Mozilla Firefox’ window. Click Apply Update button to download latest updates. 3. Once updates are installed, Firefox browser will restart in latest available version. To check and confirm, if you are using latest Firefox browser version, open ‘About Mozilla Firefox’ box again by going to Firefox > Help > About Firefox – you should see “Firefox is up to date” under version listing. Also, you can download complete Firefox software package for the latest version from official Firefox download page. Make sure you select your language and operating system platform correctly.